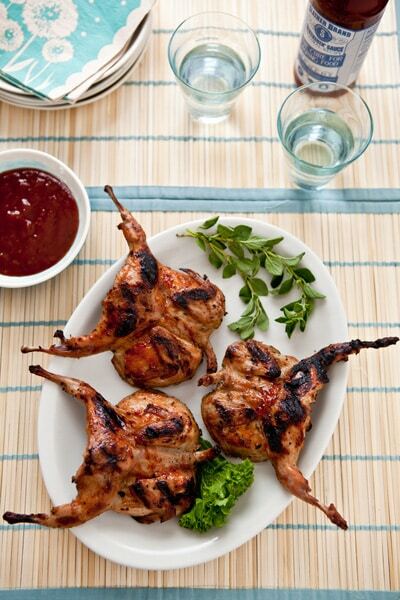 Quail are well suited to a slow barbecue: they cook easily and their skin caramelizes perfectly with Slather Brand Slatherin’ Sauce®. Open the quail by cutting along the backbone. Remove the spine and ribs. Flatten the meat and season. Prepare a moderately hot grill coal fire and place grill 4-6 inches above the grill. Put the birds on the grill and grill both sides generously brushing with Slather Brand Slather Brand Slatherin’ Sauce® until meat is cooked and skin is caramelized. Serve with additional Slather Brand Slather Brand Slatherin’ Sauce®.